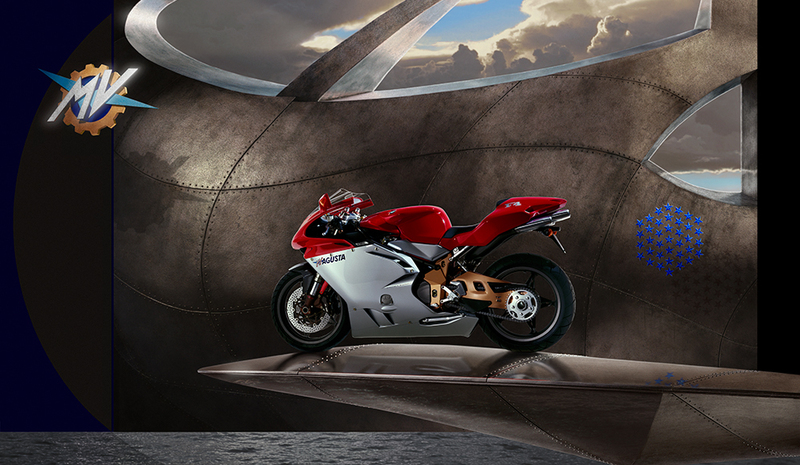 Collaborating with the iconic Italian motorcycle designer Massimo Tamburini, Robert created images showcasing the Ducati 916, in Sognare en Rosso (above) and MV Agusta F4 Oro, in Risurrezione. These prints have been shown in prestigious museums including the world-renowned Guggenheim museum in Bilbao Spain, and sold to collectors in more than 60 countries. Robert is the only artist Massimo Tamburini has worked with to create beautiful and unique renditions of his landmark motorcycle designs. Sognare en Rosso, or Dreaming in Red is the incarnation of the bike of your dreams, that’s ready to hang in any room and fire the imagination. This beautifully produced print is officially licensed by Ducati, and is now available in three sizes: 24″ x 43″, 44″ x 75″, and 60″ x 104″ (in which the motorcycle is nearly 100% life size). The graphics on the bike in the crate read “916”, however, the white tail section and Termingnoni Corsa exhaust tell you that this is actually an extremely rare 1997 SPS model. Printed on heavy semi-gloss paper with rich pigmented inks. 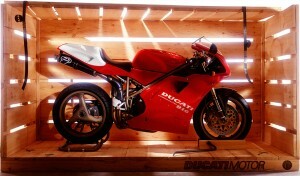 A must for the Ducatisti home, office or garage. 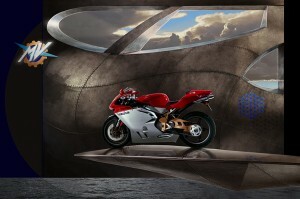 RISURREZIONE is a futuristic image that depicts the rebirth of the legendary MV Agusta. Reminiscent of the Goddess Venus in Botticelli’s masterpiece, the F4 is elevated from the waters of it’s creation and encircled by an organic metallic shell, symbolizing Agusta’s prominent history in aviation design. A concentration of intense energy at the wings apex, the F4 pierces the rhythmic shock wave of rivets. Thirty-seven stars appear as hexagon formation, each a tribute to Agusta’s 37 manufacturers world titles, an unparalleled success. The F4 that appears in our image is production #1 of the Serie Oro, owned by Juan Carlos, the King of Spain. In 2001, Claudio Castiglioni, CEO of Cagiva Group, and Rocky Agusta, the grandson of Count Domenico Agusta, together unveiled the print to an enthusiastic crowd of MV Agusta fans and journalist from around the world. The print, unveiled in Italy at the MV Revival #6 , has received outstanding praise from art critics and MV Agusta fans alike. Gold Edition: There will be only 300 Tamburini Gold Edition prints. Each are hand signed and numbered by Massimo Tamburini, Claudio Castiglioni, and the artist Robert Bullivant. 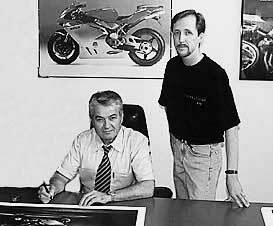 The print includes a certificate of authenticity and a photo of Mr. Tamburini signing RISURREZIONE at Cagiva’s Research Center in San Marino Italy. The lower-right portion of the print contains a hand gilded, 23K Gold emboss of the MV logo. Artist Edition: The Artist Edition prints are each hand signed and numbered by artist Robert Bullivant, and includes an emboss of the MV logo. There will be 1,500 Artist Edition prints released. These special lithographs are only available in very limited numbers. Once the edition is sold out, it is officially closed. For availability, please email us. In fairness to all collectors, we reserve the rights to limit the number of prints any individual can purchase.